Thank you for the honour of speaking on behalf of we three directors who retire this year. Many others will follow us out the door in the decades ahead – future directors yet unknown will take their turn guiding an institution that believes ideas make a difference. For it is an institution we serve. Grattan will be here long after we all vanish. It is designed to be a fixed part of the national conversation, a reliable source of policy advice, views and evidence. As we approach the first decade anniversary, we can be optimistic. As a young postdoctoral fellow, I worked for some months in the Brookings Institution at 1775 Massachusetts Avenue, Washington. It was 1988, the end of the Reagan era. George H Bush was battling Michael Dukakis to be the next President of the United States. Brookings contributed to that election year with policy proposals, state of the nation reports, and a long series of insider workshops, so commentators and future players could discuss what mattered for America. I left awed by the experience – the depth of expertise on key policy issues, the weight and gravity of the institution, the resources it could turn to any policy question. Like others who walked through those famous front doors, I wished we could invent an Australian equivalent. Sixteen years later I encountered someone thinking about such a think tank for Australia. Best of all, it was someone with the vision, contacts and chutzpah to make it happen – Terry Moran, then Secretary of the Department of Premier and Cabinet in Victoria. Terry and I earlier worked closely together on foundation of the Australia and New Zealand School of Government. An irrepressible innovator, Terry would go on to work with Premier Bracks on creation of the Wheeler Centre, Victorian Opera and the Melbourne Recital Centre. But in 2004 Terry’s ambitions were focused on an Australian think tank. In his characteristic style, Terry started with a small circle – he and Premier Steve Bracks at its centre – and then roped in others. Would Allan Myers consider chairing an exploratory board? Would David Kemp open discussions with the Howard government? Could the University of Melbourne and I provide a home for a think tank while accepting its independence? Soon a group of talented DPC officers – among them Chris Barrett, Ben Rimmer, Donald Speagle, Greg Hywood and Ian Wood – were working up proposals while Terry spoke with corporate leaders. 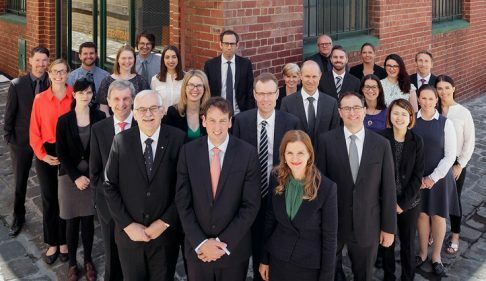 A pro bono McKinsey and Co report, generously led by CEO Adam Lewis, developed the blueprint for a Melbourne-based, but nationally focused, think tank. Many hands were pressed into the effort. Some lobbied the Howard government for funding, others opened talks with potential philanthropic backers. Eventually a small operation was set up in my office at the University of Melbourne to begin the practical work of finding a location, recruiting staff, and building the required administrative systems. Just before the 2007 election, following a path already beaten by Terry, Steve Bracks and David Kemp, I called on federal Treasurer Peter Costello to seek Commonwealth support. Eventually it was Finance Minister Lindsay Tanner and Treasurer Wayne Swan who agreed to match the financial contribution from the Bracks government in Victoria. By early 2008 we had money and the outline of an organisation. With Allan Myers as chair, and Terry Moran and I among the members of an interim board, just two essential ingredients remained – a name and a director. A name should be easy – just find an eminent Victorian. Hence for planning purposes this was the Pearson Institute, honouring educationalist and statesman Charles Henry Pearson. He seemed the ideal choice until some background checking found some very unfortunate printed views. So after considering first Parkville and then Carlton, we settled on Mr Grattan – an innocent abroad, with no obviously indiscretions, and a nod to the planned locality. Finding a director should be more straight-forward. Well, not quite. This was a new institution, with no track record. We needed someone passionate about public policy but not identified with any political party or ideology. It took a brave person to apply. Much of our field comprised former politicians or ministerial staffers – fine people, but the wrong signal. If it took a brave person to apply, it took an even braver one to accept the job. John would inherit a board with strong views and very high expectations, with multiple supervisors keen to tell John how to do his job. As we learned, John knew to hold his ground. He would smile no matter how contrary the demands, show patience when a reasonable person might grind their teeth, and explain – as many times as it took – the time lines involved to recruit expert staff, and the reasons to be careful and focused in choosing areas for study. As CEO John chose an excellent Grattan team, and steered a skilful middle course between ideologies, parties, expectations and occasional explosions. Early board papers and conversations confirmed an ethos for the Institute. Grattan would be independent, rigorous and practical. It would measure influence and impact. The primary currency would be reports, each embedded in technical expertise but written for a wide audience. There would be events across the country to discuss reports and annual provocations, such as the Prime Minister‘s Summer Reading List and an annual gathering of policy experts. The Institute would also be patient. The ideas business is slow. New ideas must push against entrenched interests, community indifference, a bias for inertia. It takes persistence and hard work before evidence can find a new audience. The conversation must move through a now familiar cycle – first dismissal of the report, then defence on difficult points and, finally, negotiation on the way to a better policy. That persistence has been impressive. Grattan releases up to 16 reports a year, each downloaded on average 3,100 times, and distributed widely across policy networks. The Institute generates up to 500 media mentions in a typical week. Since that April 2009 launch the Institute has issued 111 reports, making key contributions to discussion on productivity, water, schools and higher education, health, energy, cities and transport, housing, retirement incomes, tax, budgets and institutional reform. The Institute has built one of the most talented unit record data analytics teams in the country. They generate original and insightful analysis across all Grattan programs. Data analysts and Program Directors work closely with the Grattan communications team. John hired two talented editors – James Button, who won a Walkley last week, and Paul Austin. They ensure Grattan communicates complex policy in ways that are easy – and pleasurable – to grasp. Even so, there are inevitable controversies and criticism. It is easier to attack an author than to deal with a report. There are always interests at stake, strong and contrary views from people who do not welcome Grattan joining the discussion. As John discovered recently, even former prime ministers buy in. John found himself monstered on prime time television by an angry Paul Keating on the subject of money in retirement. This encounter joins a long list – angry voices disputing Grattan advice on energy, universities, housing affordability and hospital funding. But Grattan gives as good as it gets, and sets standards for a real policy discussion. I admired watching Tony Woods hold the line on the reality of energy choices, delivering his report Keeping the Lights On two days before a major power outage in South Australia. I applauded the way Ben Jensen shifted a superficial schools debate toward evidence-based action, while Jane-Frances Kelly anticipated issues about cities now much debated. We have seen fellow experts embrace the evidence provided – Treasury officials citing Grattan work on economic benefits, inquiries quoting Grattan findings and data. This is policy influence at work, crossing party lines. In a Senate Committee of Inquiry into the Commission of Audit, government and opposition senators at loggerheads all still relied on, and mentioned, Grattan insights. Rigour and credibility attract attention from business and philanthropy, keen to be associated with the undoubted independence of Grattan analysis. So to original government funding there has been support from Google and GE, from large Australian companies such as BHP, NAB, Medibank Private, Wesfarmers, Westpac, Woodside, and Jemena, from professional services firms Arup, Ashurst, Corrs, Deloittes, Ernst & Young, Maddocks, McKinsey, PWC and Urbis, and substantial contributions from the Myer, Susan McKinnon, Scanlon, Cuffe and Origin foundations. All this alongside the 203 individuals who donated to the Grattan last financial year. There is, of course, a long way yet to travel. When the Brookings Institution celebrated its century in 2016, it could report turnover of $US 100 million a year, an endowment of $346 million, and around 300 analysts on staff. This is ten times or more our scale. Yet in our first decade – with the stability of two great chairs in Allan Myers and Alex Chernov, an impressive board of Australians committed to better policy outcomes, a single CEO in John Daley to give coherence and a public face to the enterprise, and the many talented people who lend their dedication to the project – we have beginnings that will stand comparison with Brookings. For those of us leaving the board, it is hard not to be a little rueful. Board meetings are lively and engaging, while the Public Policy Committee foreshadows the clash of ideas in action. Proposals for new projects are always contested, an opportunity to dream large about the country we want to see. I hope in time, while John and many original participants are still around, the board will commission a history of the Institute. Meanwhile it has been an honour to be part of this journey.